It is not a requirement to attend first night to attend this lecture. First described in the Extensive Enjoyment Sutra by Buddha Shakyamuni, this diagram depicts the nature and causes of cyclic existence. Yama, the lord of death holds the wheel in his teeth and claws reminding the viewer of impermanence and that there is not a single being in cyclic existence who is outside the control of death. 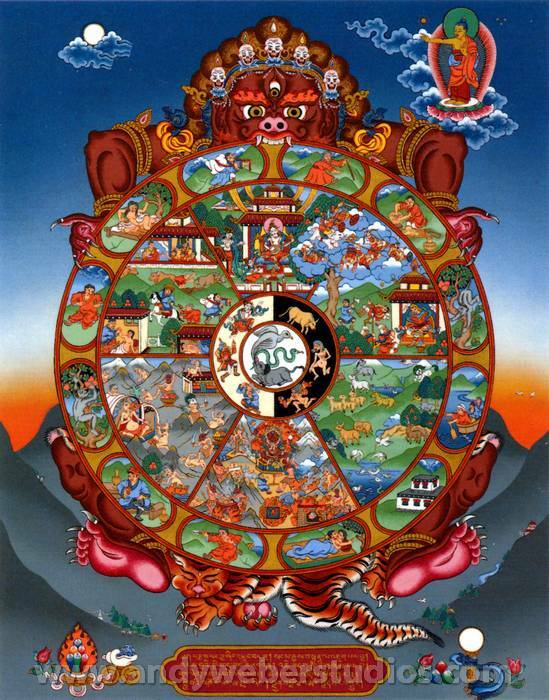 To break the chain of endless cyclic of death and rebirth we need to eliminate the fundamental delusions of ignorance, hatred and greed, depicted by the three animals – pig, snake and pigeon – in the hub of the wheel. Not to be missed for anybody who wants to gain an understanding of the sacred imagery of Tibetan Buddhist and uses the images in their meditations to follow the path to Enlightenment. Andy Weber is also leading a weekend art retreat at LMB. See info and register here. 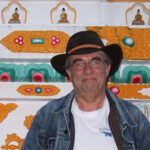 His unique style of authentic images for visualization are highly respected not only by the growing number of Western Buddhists but also by Tibetan Lamas of all traditions, many of whom have commissioned his work. His thangka paintings (= Tibetan scroll paintings) can be seen in Buddhist centers and temples throughout the world including the Potala Palace in Lhasa and his images have become well known and popular through numerous publications. With over 35 years of experience Andy Weber and his students offer their artwork, their services, and their experience to the wider Dharma community. Andy also teaches all over the world, and the teaching schedule is available from his website, Andy Weber Studios.